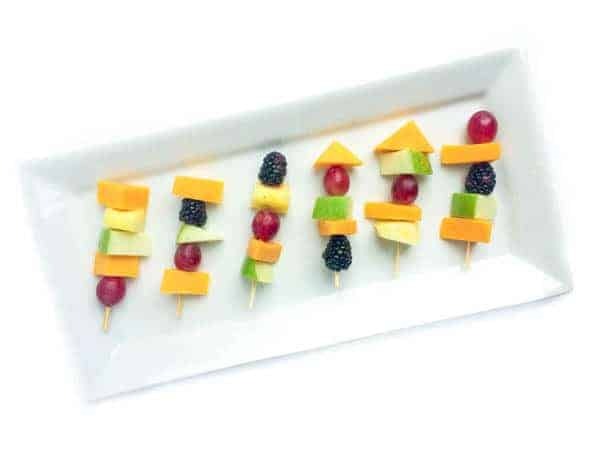 The perfect lunch box treat or after school snack, these fruit and cheese kabobs are kid-friendly and adult approved. Fellow moms often ask for tips on feeding picky eaters and I frequently respond with “Get them in the kitchen!” It’s true – the more involved your kids are in the process of preparing the food, the more involved they will be during the consumption of food. Hands down. Want to know another secret weapon for getting little ones to eat the rainbow? SAY CHEESE! 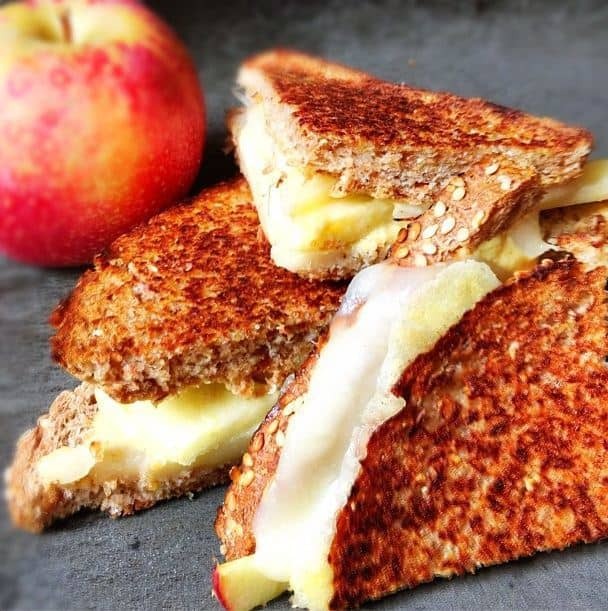 Studies show that produce intake is often boosted when foods are paired with irresistible cheesy goodness. So get the kids involved starting at the grocery store by letting them pick out their favorite fruits and cheeses then bring them in the kitchen and let them get to work! 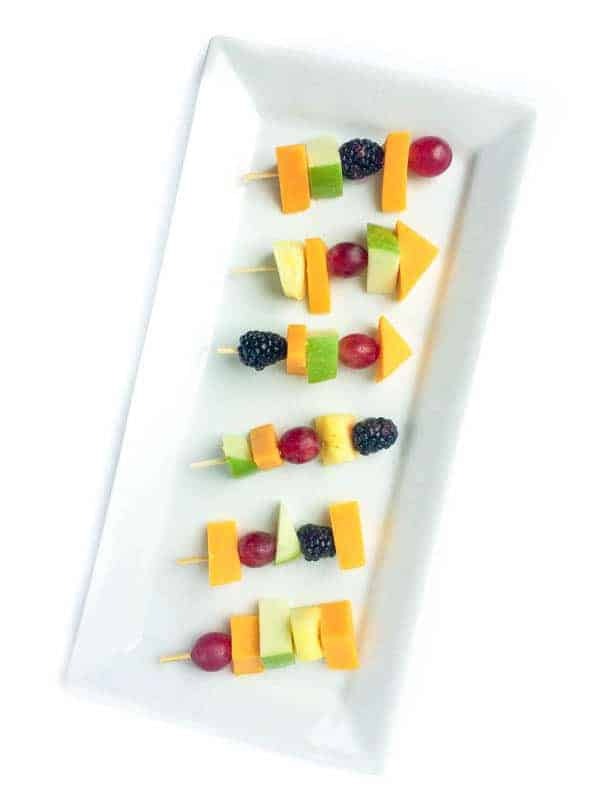 These fun fruit and cheese skewers are not only easy to make but great for using up whatever you have on hand to help avoid food waste. We happened to have green apples and my boys love grapes and pineapple but the possible fruit and cheese combinations are endless. 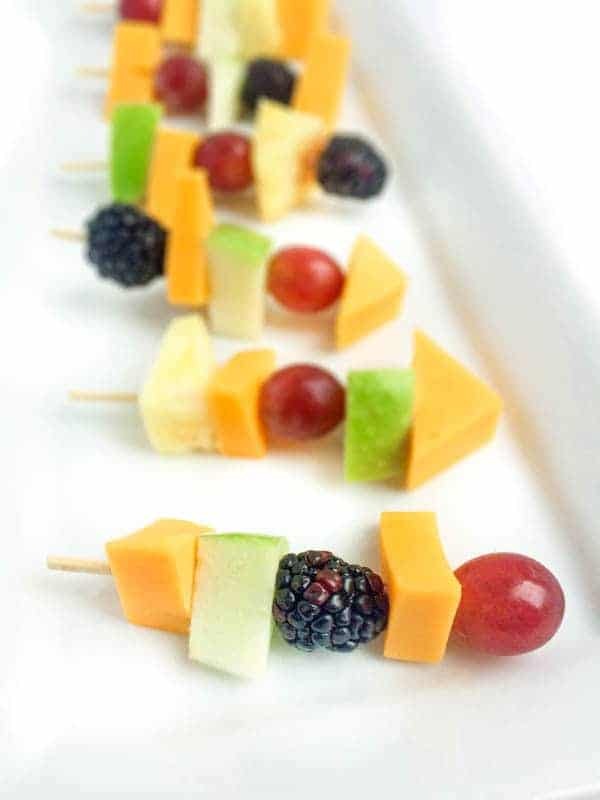 Prep your fruit skewers ahead of time then grab from the refrigerator throughout the week while packing lunches or for after school snacking. The balanced combination of protein, healthy carbs, calcium and other nutrients is ideal for giving little ones long lasting energy to get them through their day. What are your best tips for feeding picking eaters? I’m all ears! Toss apple chunks with lemon juice to prevent browning. Working one skewer at a time, carefully thread one piece of each fruit and two pieces of cheese on each skewer. Repeat until all 8 skewers are done. Serve immediately or store in a refrigerated air-tight container for up to 5 days. These would be great for my weekly wine club! Ideal for that!! Can I come? These would be great in my sons lunchbox. Love it! PERFECT for the lunch box! When I nannied I made these all the time for the kidlets – reminds me of how much I enjoyed them as well! Awww I love that so much!! I didn’t know you nannied!! Yes, about 7 years ago. Same family – three kids. Basically raised them from birth until I stopped. The youngest is my god-daughter, and we have become good friends with the family. Its always funny how just changing up the prevention of fruit makes it more delectable! My little one is all grown up now, but I’m sure she would still love to eat the rainbow with these adorable kabobs (and so would her mama!) Great summertime treat. I hope it wouldn’t be too weird if I made these to eat as an after school snack….even though I have no kiddos. Sometimes even adults need veggie/fruit eating help! I love the idea of prepping these ahead of time and grabbing them throughout the week. Everything is way more fun on a stick! My 3 1/2 year old has gotten picky in his old age. :) I like your ideas for picky toddlers. These are so pretty and fun–my kids would love them. Yeah for eating the rainbow! Fruit and cheese on a stick – just hand me a few of these so I can chow down! I could easily munch on these all. day. long. Yum! Definitely a great (and cute!) way to eat the rainbow! You know me – always eating the rainbow haha. My kids would live on fruit and cheese if I let them. These are perfect! That is the absolute truth Brianne! 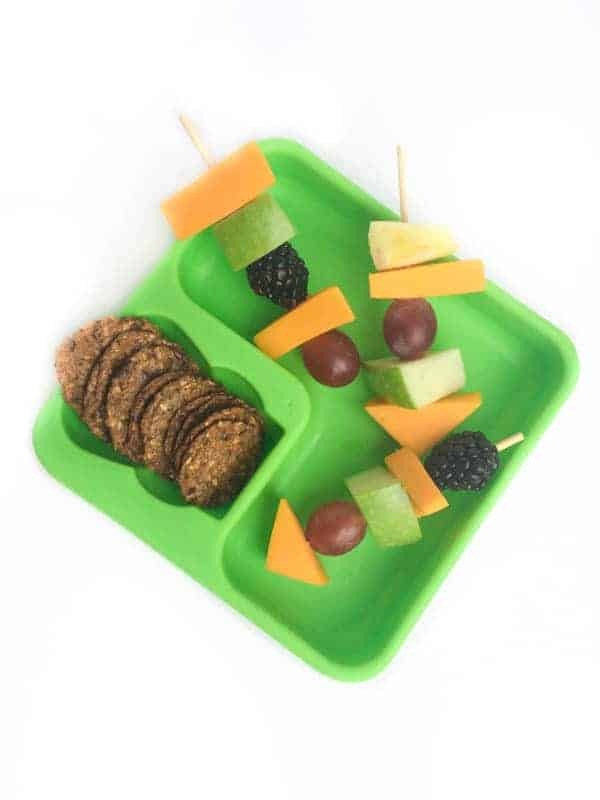 What kid (big or small) doesn’t love fruit and cheese kabobs? They’re also a fun way to get the kids involved in the kitchen to help you to put them together! It’s funny how something so simple can get kids to gobble up tons of fruit!! Cheese always gets my daughter to eat! Love these simple skewers! Isn’t that the truth!!! When in doubt: add cheese.